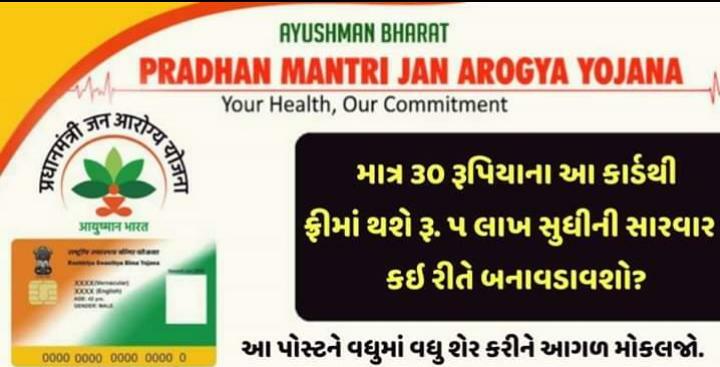 You can treat up to 5 lakh free treatment by making this special card for 30 rupees under the Ayyushma scheme launched by the Modi government. The name of this card is a golden card, though this should include your name for this scheme. Under this scheme, about 50 crore people of 100 million families are involved in the scheme. Treatment upto Rs 5 lakhs will be given free of cost. All the transactions related to patient related to lifelong India plan will be paperless and cashless. For this, through the participation of the policy commission, an IT The platform will be functional. Apart from this, the amount received for the beneficiary will be deposited directly through direct debit transfer.